B. Thomas (Arlington, Texas, United States) on 22 January 2019 in Animal & Insect. Those hairy legs are not mine! 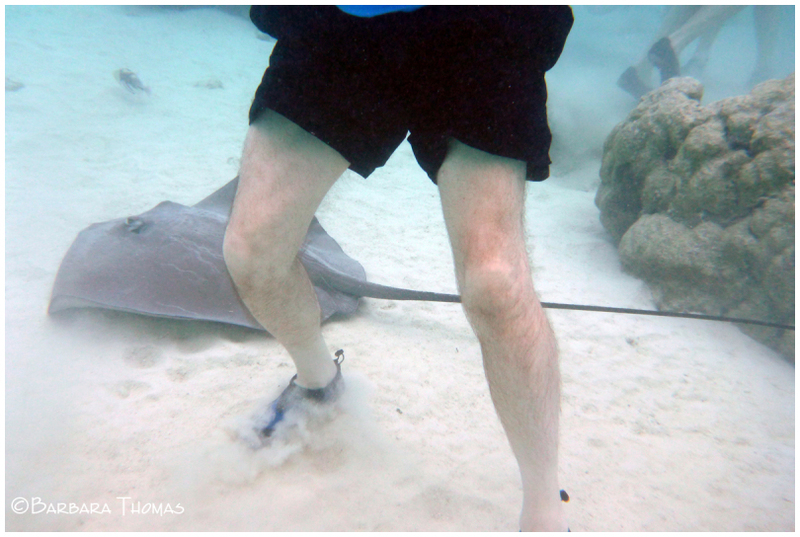 While on a lagoon tour I ducked below the surface of the water with my little Panasonic DMC-TS4 underwater camera as a stingray swam by. They would come to the surface and brush against us waiting for food. Maybe you may say that fortunately it is not shark. A great capture. The Stingray does not seem to mind having company in the water. how close by the sting ray is going about !!!!Wow ! A good shot ! Happy ST. DOing the stingray dance? :-) Superb capture ! Happy ST ! Happy ST, great photo choice for this day. I think I would be a little uneasy with them swimming by me. You were brave. That is too funny! The stingray behind him is beautiful! Happy ST! Funny and great underwater shot.